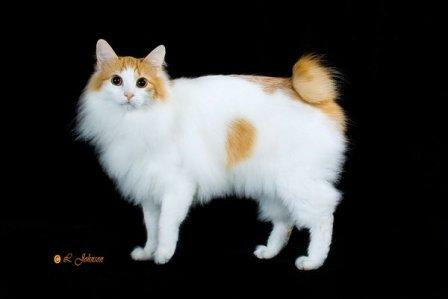 The origin of the Japanese Bobtail Cat is rather vague. From the various manuscripts found and early artifacts from China and Japan, it would appear that they originated in Korea or China almost 1000 years ago. It is possible that they arrived in Japan as 'ships cats' in 999 AD. Many 11th century artworks, artifacts and prints depict short-tailed cats resembling the Japanese Bob. Short-tailed cats are found throughout South East Asia. There is speculation that these cats originated from the Kurile Islands, the home of the Kurilian Bobtail cat (or vice versa). Irrespective of their origin, Japan has certainly claimed this cat as their own. In 1602, a law was passed in Japan that banned all citizens from buying, selling or keeping cats. All domestic cats had to be set free as they were needed to control the ever-increasing rodent population. Rodents were threatening the silkworm industry, rice crops and rice-paper scrolls. Japanese Bobtails and their long tailed counterparts lived in the streets and farms of Japan and were simple working cats. This situation would appear to have changed by 1701. Kaempfer, a German doctor visiting Japan wrote that the black, yellow and white short-tailed cats that he came across expressed no interest in hunting rodents or anything else. They were in fact more often found lounging on the laps of their owners! Of one thing we are certain is that this cat is revered in Japan. At some stage during the history of this cat breed, only royalty and aristocracy were allowed to own these tailless cats. The tri-color (aka the Mi-Ke) variety which is a black, reddish-brown and white cat is the most honored cat and is a symbol of happiness and good fortune. In Japanese art and culture the Maneki Neko sculpture is seen with its right paw raised in a beckoning motion - the cat depicted in the statue is a Japanese Bobtail cat. These statues are found at the entrance of businesses, restaurants, shops and temples. 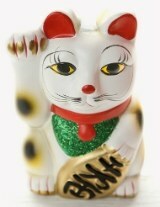 Maneki Neko means Lucky Cat, or Beckoning Cat, Money Cat or Fortune Cat. The many legends behind this statue makes for interesting reading, but we will leave that for another time. These short-tailed cats first hit American shores after WWII in 1945 when US Servicemen brought them back as pets. Twenty odd years later, in 1968, Judy Crawford who was living in Japan sent a breeding pair to Elizabeth Freret and Lynn Beck in the United States. Elizabeth Freret and Lynn Beck are credited for writing the breed standard and for establishing the cat breed in America. Today it is accepted by most cat registries except the Governing Council of the Cat Fancy (GCCF) in the United Kingdom. These ancient cats are rare cat breeds that are owned by only a lucky few. One story goes that a cat with a regular tail was warming itself in front of an open fire. As time passed, the cat crept ever closer resulting in its tail setting alight. The terrified cat panicked, sped out of the house and raced down the streets setting fire to shops and houses throughout the city. The Emperor of Japan was outraged and ordered that every cat in Japan have its tail removed. And that according to legend is how they got their short tails. The truth is that the short tail is as a result of a genetic mutation which is caused by a recessive, autosomal gene. So, if both parent cats have short tails and carry the gene, their offspring will also have short tails. There are many tales and legends related to the Bakeneko, or monster cat. 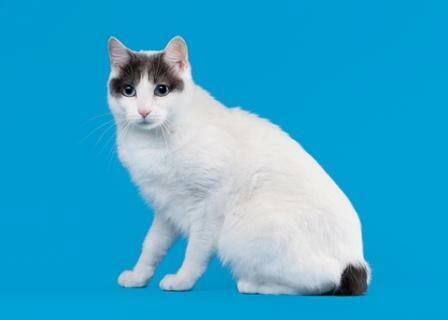 All appear to have a connection to the Japanese Bobtail cat. In Japanese folklore, cats that retained long tails would after a certain time gain supernatural powers. These cats would eat everything in their path. Bakeneko had the ability to change shape and form and speak like a human and even had the power to raise the dead. This led many superstitious Japanese to cut the tails off their domestic cats to prevent them from becoming a Bakeneko.